Sporting Challenge have been awarded £1050.80 from the Skipton Building Society to go towards the cost of various sporting activities over the next year. This funding will allow the Sporting Challenge to try new activities as well as ones tried before. The donation will enable the group to introduce more people in the area who have learning difficulties to creative and fun exercise sessions. Sporting Challenge is made up of parents and carers who have been providing sporting activities for around 30 people with learning difficulties in West Lancashire for nearly three years. They organise evening and weekend activities including ten pin bowling, aerobics, swimming and now kurling golf. The classes are a great way for their service users to have fun, make friends and lead an active lifestyle. And they also provide some respite care for their families and carers. Chairman of Sporting Challenge, John Haggart said that he was delighted with the donation Sporting Challenge had received from the Skipton as it has enabled us offer more activities for our members. Thank you very much on behalf of everyone. Sporting Challenge, a group of parent carers providing sporting activities for local adults with learning disabilities held a sponsored Walk on the 2nd September. It started at the Ring O’Bells and we walked along the canal to Parbold and back. The walk was about 4.5 miles and took 2 hours to complete. The walkers included members of the Sporting Challenge board, staff, parents and people who take part in our sporting activities. The weather stayed dry and the walkers enjoyed a nice afternoon, whilst raising much needed funds for the group. “Many people with a learning disability don’t take part in any exercise activity because the family carers who support them are either not motivated or unable to take them on such activities which they can’t attend on their own,” he added. Young adults with learning disabilities from right across West Lancashire were praised after taking part in an Olympic-themed evening. Sporting Challenge organised the event at Skelmersdale Cricket Club, which ended with a prize giving ceremony with special guests Cllr David Sudworth, West Lancashire Borough Council’s Cabinet Member for Health, Leisure and Community Safety, and County Cllr Carolyn Evans, Lancashire County Council’s Champion for the Disabled. The event was the brainchild of Sporting Challenge secretary and trustee, Edward McCarthy, who had himself gone to watch the Olympic Games, and thought it would be a great idea to hold an Olympic themed night. Together with Chairman John Haggart they got to work with some more unusual ideas, including javelin throwing, circus skills and welly throwing! The evening was funded through a grant awarded by County Cllr Evans and regional radio station Real Radio supplied the event with “Olympic” medals to give out to all the participants. Cllr Sudworth said: “I was delighted to attend Sporting Challenge’s event along with Cllr Evans and present the participants and their carers with their prizes. They were extremely enthusiastic and it was clear everyone had a great time. Attached photos shows Cllrs David Sudworth and Carolyn Evans handing out medals at the prize-giving at Skelmersdale Cricket Club and the evening itself. The Sporting Challenge Olympic Night took place at Skelmersdale Cricket Club on 30th August 2012. There is a full article about the event. This page has a selection of photos from the evening. 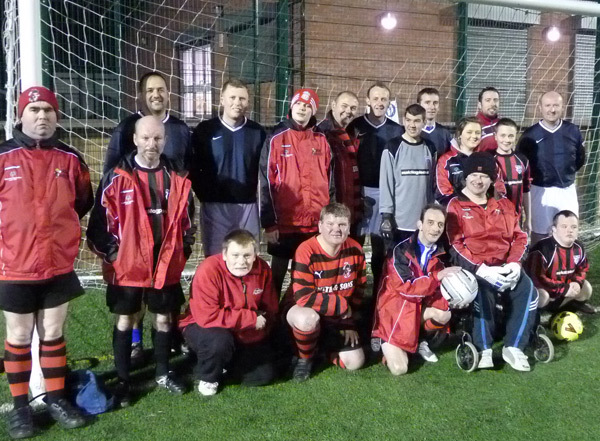 Sporting Challenge are a group of Parent/Carers who from 2008 have been providing sporting activities for around 30 people with learning disabilities in West Lancashire to keep them fit and healthy. These evening and weekend activities include Ten Pin Bowling, Aerobics, Swimming and Boccia/Kurling at local Sports Centres. Many people with a learning disability don’t take part in any exercise activity because the family/carers who support them are not motivated or are unable to take them on such activities and they can’t go on their own. We provide Sessional Workers who will collect them from where they live, support the people whilst they are at the sports centres and then return them home after the activities. Sporting Challenge has obtained a grant of £540 for Boccia/Kurling from the Yorkshire Building Society Charitable Foundation. This will allow us to run sessions of Boccia / New Age Kurling at Burscough Wharf. Many thanks to the Yorkshire Building Society Charitable Foundation. For more information click their logo below. Sporting Challenge are celebrating the London 2012 Olympics and Paralympics by organising a special evening event. The evening will be a lot of fun in what has been a brilliant summer of British sport. Have you got what it takes to win a medal? The Medals will be awarded by special guests. There will be a variety of usual and unusual games , an Olympic Torch too and flags. Taking place at Skelmersdale Cricket Club on Thursday 30th August, please get in touch for more details. Sporting Challenge are holding a sponsored Walk on the 2nd of September starting at 1.30pm at the Ring ‘O’ Bells pub (L40 5TE). The walk will be to Parbold and back, which is around 4.5 miles and should take about 2 hours. Your support is gratefully received. For more details please get in touch. On 23rd July 2012 it was the latest ten pin bowling night at Southport Premier Bowl, on Ocean Plaza. Everyone really enjoyed the evening and there were quite a few strikes. Please get in touch for more information on the activities on offer. Sporting Challenge held their 2012 AGM on 2nd July 2012 in Lathom , near Ormskirk, Lancashire. The meeting was fully attended. The charity is looking forward to the year ahead. Here is our Chairman’s Report. Sporting Challenge has continued to build on the success of previous years by increasing the number of activities it provides which now include: Zumba, Dance and Drama, Fitness Training, Swimming and Wii Games. The funding has come mainly from: Baily Thomas, Co-operative Community Fund, Foyle Foundation and the Big Lottery Fund. Also a sponsored walk we held in May 2011 raised £800 towards other activities not funded by grants. Achieving charity status in February 2011 has helped in accessing further funding.